The Marshall School of Business, part of the University of Southern California (USC), was founded in 1920 as the College of Commerce and Business Administration. The school was renamed in 1997 after a $35 million donation from alumnus Gordon S. Marshall, who currently serves on the university’s board of trustees. 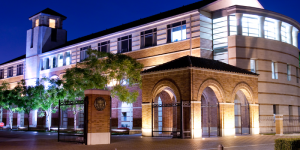 Marshall is the oldest AACSB accredited school of business in Southern California, and its internationally recognized entrepreneurship program is the first of its kind in the United States. The school offers a full-time MBA, part-time MBA, Executive MBA, an Accelerated MBA, and an International Business Education and Research MBA. Marshall also partners with Shanghai Jiao Tong University to offer a Global Executive MBA in Shanghai. Most of Marshall’s buildings are located in the southeast corner of USC’s 226-acre University Park campus in Los Angeles, California, where a majority of Marshall’s programs are housed. However, some part-time first-year courses meet at the Orange County Center in Irvine, California, and some executive courses meet at La Costa in San Diego. While a small number of courses are taught in Bridge and Hoffman Halls, these buildings have primarily served the undergraduate business program since Popovich Hall—the main building of the Marshall School—opened in 1999. The 55,000 square foot, $20 million complex features eight study rooms as well as 13 classrooms that are specifically designed for case study discussions and experiential learning and are capable of transmitting lectures and presentations throughout the entire building. The Hall also houses the Popovich Cyber Café, a popular venue that offers three full meals daily in addition to snacks and smaller meals throughout the day. Hoffman Hall houses the Crocker Business Library, which has over 4.5 million volumes of books, bound journals, and government documents. The library also gives Marshall students and faculty access to thousands of video recordings, manuscripts, and cartographic materials, among other resources. The school also plans on opening the brand new Fertita Hall in fall, 2016. The newest campus addition will be five stories and 102,000-square-foot, located at the southeast corner of the University Park campus. The new building will mainly host undergraduate courses. USC Marshall employs over 267 faculty members who teach across seven academic departments: Accounting; Finance and Business Economics; Information and Operations Management; Marketing; Management and Organization; Management Communication; and Entrepreneurship. There are 561 total students enrolled in the full-time, part-time, executive, and IBEAR MBA programs. In addition to the full-time and part-time MBA programs, Marshall offers an Executive, online, IBEAR, and Global Executive MBA programs.